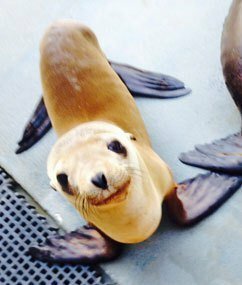 Late last month, a tiny and extremely lost 36-pound sea lion pup ended up about 100 miles from the Pacific ocean when he accidentally swam up the San Joaquin river and hopped over land into an almond orchard East of Modesto. The plucky pinniped was nicknamed "Hoppie" for his flopping attempt to leave behind a life bound to the sea. According to the Fresno Bee, Hoppie was found on Mape's Ranch about eight miles East of Modesto. Ranch hands were working in the almond orchard when they spotted the little guy moving along the edge of a field at least a half mile from the river. Mistaking Hoppie for a sea otter, they watched him flop around a little more before he took a rest in the almond grove. "I thought, 'That's the biggest sea otter I've ever seen,' " ranch owner Billy Lyons told the Bee. "I just couldn't believe it to be honest with you. We just stood there and kept an eye to make sure it wouldn't hurt itself by jumping into one of the underground pipelines." After a few calls, local assistant wildlife refuge manager Eric Hopson managed to coax Hoppie into a cage in his truck and bring the animal to Dublin where he handed off the undoubtedly frightened creature to a volunteer from the Marine Mammal Center in Sausalito. A few days later, the Center's veterinary staff reported Hoppie was being treated for malnourishment and recovering nicely. Hoppie is actually not the first local sea lion to head this far East. In 2004, Chippy, a 315-pound adult California sea lion was found near Los Baños, California. Chippy had apparently become confused and disoriented after being shot in the head by an unknown assailant. After a stint in rehab with the Marine Mammal Center, Chippy eventually returned to the oceangoing life near Point Reyes.